It is no secret that construction sites are dangerous places, and not just for the workers who face these dangers every day. Bystanders and visitors to these sites also face substantial risk, particularly when site owners and managers fail to employ reasonable safety measures. In some areas of Phoenix and Arizona, pedestrians or bicycle riders are forced to pass by construction zones. The last thing they expect is to be struck in the head by a defective scaffold or run over by a construction site vehicle, but these unfortunate events are quite possible in and around construction sites. The skilled lawyers of Plattner Verderame, P.C. understand the inherent dangers of a constructions site. We have extensive knowledge about the regulations and responsibilities of site managers and owners. Our highly capable Phoenix construction site injury lawyers also know how to hold these parties responsible when bystanders and visitors are injured by acts of negligence. Injuries resulting from construction site accidents can prove life-changing and require substantial medical treatment. We know how to get you the compensation that you deserve, while consistently practicing law with high ethical standards and integrity. We help honest people secure compensation for their honest injuries. What are common construction site injuries for someone visiting or passing by a construction site? Falling objects. This may include scaffolding, equipment, cranes and even people. Construction sites often have worked being performed from elevated locations. When adequate safety measures are not in place, gravity can take over, sending dangerous objects speeding towards the ground toward innocent people who just happen to be located below. These incidents can lead to broken bones, traumatic brain injuries and other severe conditions. Hazardous material exposure. Workers often need to use hazardous materials, but exposure to these materials can cause injury to the lungs, skin or eyes of bystanders and site visitors. The dangerous nature of these materials requires careful handling and proper disposal. When site workers handle them in a negligent manner, they endanger themselves, along with others in the immediate vicinity. In some instances, exposure to hazardous materials can carry lifelong consequences and even be fatal. Vehicle accidents. Construction sites are filled with vehicles, but not just any vehicles. Workers use heavy dump trucks, cranes, backhoes and tractor-trailer trucks to carry materials and perform their duties. These vehicles are extremely large and heavy, especially when filled with building materials. They can cause severe damage when they strike other cars, and they can prove deadly when coming in contact with a pedestrian or bystander. Slip and falls. These injuries are common in and around construction sites, where walking surfaces may be in disarray. Workers may have pulled up parts of an adjacent sidewalk or there may be scaffolding blocking the flow of pedestrian walkway. Equipment carelessly left about can also create a slip-and-fall hazard, along with spilled liquids and other materials. Site managers and owners have a duty to adequately warn bystanders of hazardous conditions and make reasonable efforts to repair them. Failure to address these risks can lead to serious injuries, like broken bones or injuries to the brain. At our firm, we pride ourselves on providing every client with high-quality legal representation. We employ our resources and skills to help individuals who have been seriously hurt in industrial-site related incidents. Our extensive litigation skills and knowledge of the law has provided us with a reputation for quality legal services. Attorneys from across the country call on us to assist them with the most complex of legal cases. 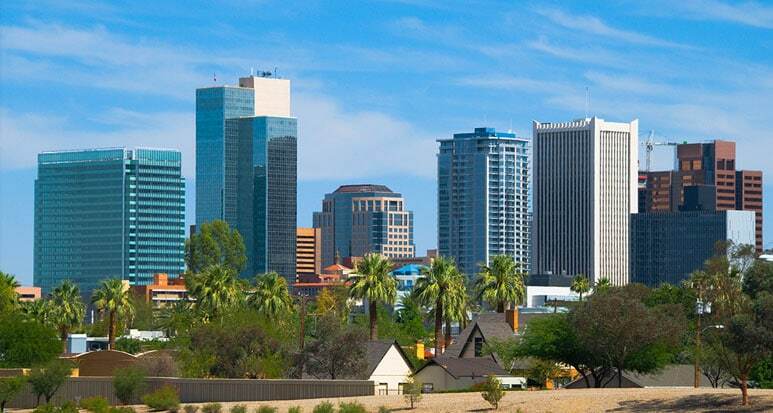 Our Phoenix construction injury attorneys proudly put this experience to work for the people of Arizona by conducting thorough investigations into injuries and crafting comprehensive cases for high-value compensation. While large settlements are often the preferred conclusion for a construction site accident case, we are not afraid to litigate if the need arises. In fact, we prepare every case as if it’s going to trial. Defendants and insurance companies are more willing to settle when they know that opposing counsel is fully prepared for trial. This allows the credibility to better negotiate for a high-dollar agreement. If you or a loved one has been injured while walking by or visiting a construction site in Phoenix, we are the law firm for you. Our contingency-fee arrangements allow you to secure high-quality legal representation without the stress of funding up-front legal costs. Contact Plattner Verderame, P.C. to discuss the merits of your case with a knowledgeable Phoenix construction site injury attorney. Call us at 602-783-8793, or fill out our contact form today.